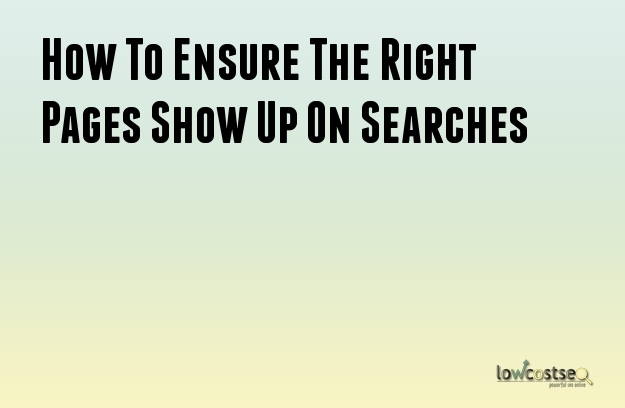 Getting a high ranking result is always useful, but what if its not the page you want? If you have a large website, there are often different elements that you want to appeal at different points. Great SEO services shouldn’t just get you high results, they should get you the right high results. For example, if a search query for “buy shoes” is linking to your contact page – rather than your commercial pages – that’s an issue. It might be a high-ranking area, but it won’t deliver the click through rates or profits that you actually want. This is a prime example of a wrong page rank scenario, so how can you go about fixing – and avoiding – this? If you have this issue, the first thing you should do is audit and compare your various web pages. Use the keywords targeted on each page, to see the difference. If there’s a big gap, for instance, between your targeted page and the page that ended up being successful with that keyword, that would indicate a severe underlying issue. Is The Keyword Targeted Properly? When looking at the pages in question, you should try and understand if the keywords are targeted correctly. There are various tools, be it Google’s own suite or a private system, that can help showcase the strength and visibility of your keywords. On the other hand, have a look at how each page is structured with this anchor text in mind. For the page with the better results, is the keyword being picked up in H1 tags and other important areas that aren’t found in the page you would prefer? It’s a simple mistake, but it can happen. This is especially true when dealing with long-tail keyword results – sometimes a given page is accidentally set-up to be a more obvious target for Googlebot. Avoid a heavy use of Java and keep your website in a format Google understands. As for pages you don’t particularly want to come-up on Google, block these from being crawled – it will give the pages you do want a better chance. Finally, it might just be possible that external links are overpowering a certain page over another. When it comes to website optimisation, external links, especially natural ones, are harder for you to control, this might be a case of steering into the wind. After all, if your customers, clients and third party websites are choosing to link to these pages, why is this the case? If you can’t change how they link, consider improving the page in question, helping it to align more with your goals.